Topic: Type that for me please! Voice Dictation has been around for a number of years now, but the issue has always been how fast and accurate the computer can transcribe what you are saying into text. Now we are seeing mobile devices being able to recognize our voice and transcribe what we are saying as well. Join us this month as we take a look at voice dictation and commands for your Mac and iOS devices. We will review Apple’s built in software as well as Dragon Dictate for Mac, and have a conversation with Siri. Also we are kicking off our 2013 membership drive. 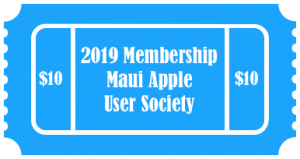 Click over on right sidebar to pay and update your 2013 Maui Apple User Group Pro Membership dues. To see the benefits of a paid premiere membership click here.